Amazon’s search for a second headquarters (HQ2) was one of the biggest North American business stories of the last two years. Amazon announced in November that instead of choosing one location, it would be split between Crystal City in Arlington, VA and Long Island City, Queens in New York City. Baltimore City submitted a bid for Port Covington, but was not selected as a top-20 finalist. In the past two weeks, the state Senate nominated an outspoken Amazon critic to a state board where he could potentially veto the deal, and City Council members for the second time aggressively challenged company executives at a hearing where activists booed and unfurled anti-Amazon banners. Key officials, including freshman U.S. Rep. Alexandria Ocasio-Cortez (D-N.Y.), whose district borders the proposed Amazon site, have railed against the project. No specific plans to abandon New York have been made. And it is possible that Amazon would try to use a threat to withdraw to put pressure on New York officials. But company executives have had internal discussions recently to reassess the situation in New York and explore alternatives, said the two people, who spoke on the condition of anonymity to speak candidly about the company’s perspective. The company has not leased or purchased office space for the project in the Queens neighborhood of Long Island City, making it easy to abandon its commitment. The Port Covington Development Team, which is comprised of owners Kevin Plank’s Sagamore Development Company and Goldman Sachs Urban Investment Group with Weller Development Company leading the development and construction, is making a second pitch to Amazon to come to its 235-acre, $5.5-billion South Baltimore development. “In light of the recent news that Amazon may be reconsidering its HQ2 plans, we have already reached out to Amazon and plan to resubmit our Port Covington proposal directly to Mr. Bezos,” said Weller Development Company President and Founding Partner Marc Weller in a statement. Amazon announced it would eventually bring 25,000 jobs to its New York City campus which would be spread across multiple tall buildings. 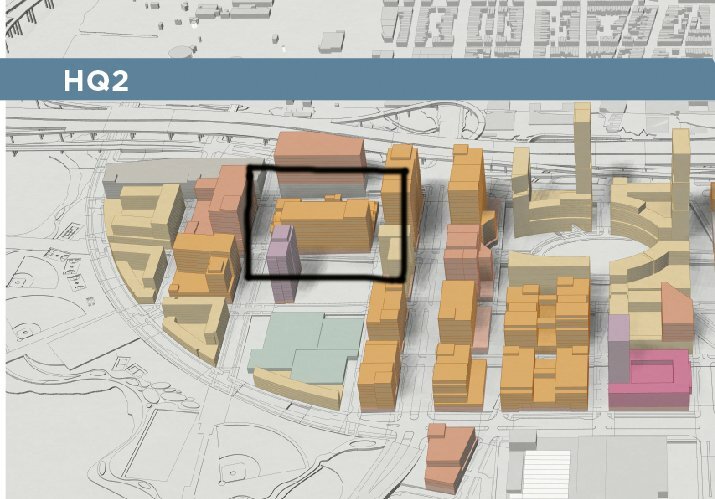 The Port Covington Development Team and the Baltimore Development Corporation, which assisted in the bid, did not receive a lot of information last year pertaining to why Baltimore’s proposal did not make Amazon’s final 20, but “tech talent” was emphasized as the key factor Amazon officials were looking during a short phone call with the company. 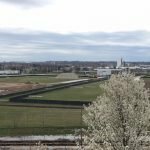 Tom Geddes, CEO of Plank Industries, which is the parent company of Sagamore Development Company, said he spoke to officials who submitted other proposals that also missed the top 20 and they too were told tech talent was the key issue. “The feedback was talent, talent, talent,” said Geddes. According to a study by Richard Clinch, director of The Jacob France Institute, the Baltimore Metropolitan Statistical Area (MSA) has 62,112 workers in computer and mathematical occupations. The Washington, DC MSA has 207,902, which is more than three times as many workers. 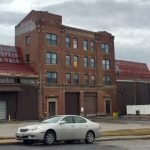 As part of the proposal, The Port Covington Development Team was offering Amazon the now-vacant Schuster Concrete building on E. McComas St. as the first building Amazon would occupy. The proposal noted the 97,000 sq. ft. building constructed in 1920 could be expanded to up to 500,000 sq. ft. with a four-story addition behind the front facade. The Port Covington Development Team also offered a “blank slate” of 177 acres that Amazon could build its campus on. 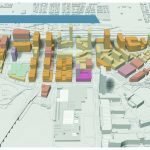 The proposal showed renderings of tall buildings scattered around Port Covington on both sides of S. Hanover St. and north of Cromwell St.
Chapter 1 of the Port Covington development is expected to break ground in the coming months. It will tackle the eastern section of Port Covington in the grass lots just east of The Baltimore Sun’s Sun Park along E. Cromwell St. It will have 3.025 million sq. ft. of new buildings across more than 12 city blocks. The first phase of Chapter 1 will be called Rye Street Market. 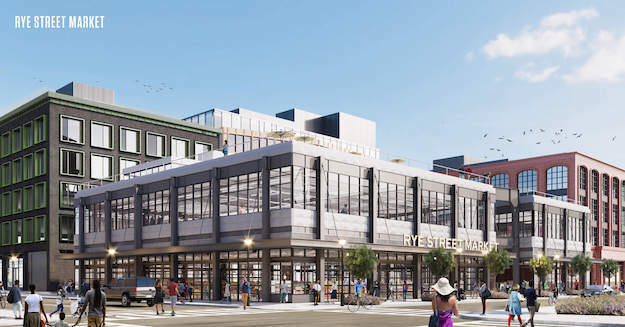 This will be a multi-block, mixed-used development across from the Sagamore Spirit Distillery on E. Cromwell St. Rye Street Market is highlighted by a large food market sharing the same name. 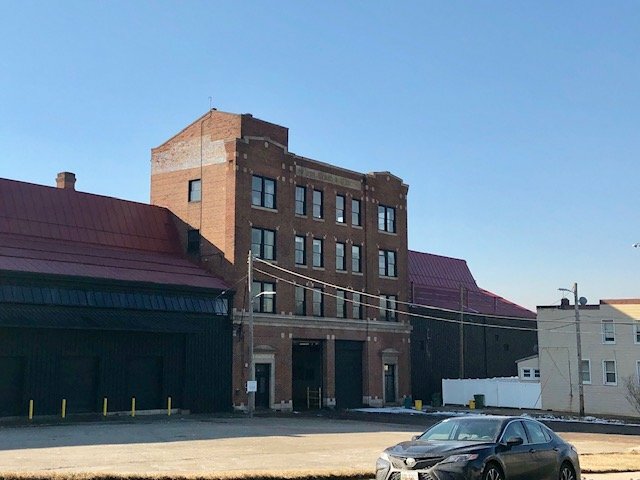 The market will be on the first floor of a block that will have four different buildings connected by a courtyard. This block will bring 180,000 sq. ft. of office space and retail. The second block just to the southeast will feature two residential apartment buildings that will include about 260 apartments in 277,000 sq. ft. The Port Covington Development Team is looking to make Chapter 1 a cyber hub and it has been dubbed Cyber Town USA by Mike Janke of DataTribe. 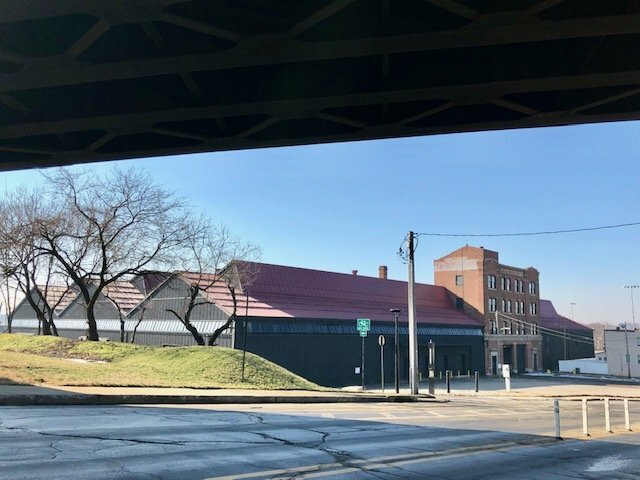 Janke is relocating his cyber startup studio from Fulton, MD to Port Covington during the first phase of Chapter 1, which is expected to open in late-2020 or early-2021. DataTribe is joined by AllegisCyber and Evergreen Advisors as the first three announced companies for Chapter 1. 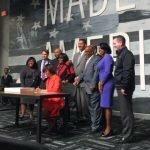 Janke said in October that the trio of businesses already have 28 companies committed to moving to Port Covington and expect up to 50 to 60 companies ready to move in when the first buildings open two years from now. Janke expects Port Covington to have just under 1,000 cyber security employees by the time the first phase of the development opens. Ackerman and Janke also noted they are in talks with large cybersecurity companies looking to bring a second headquarters to Port Covington. 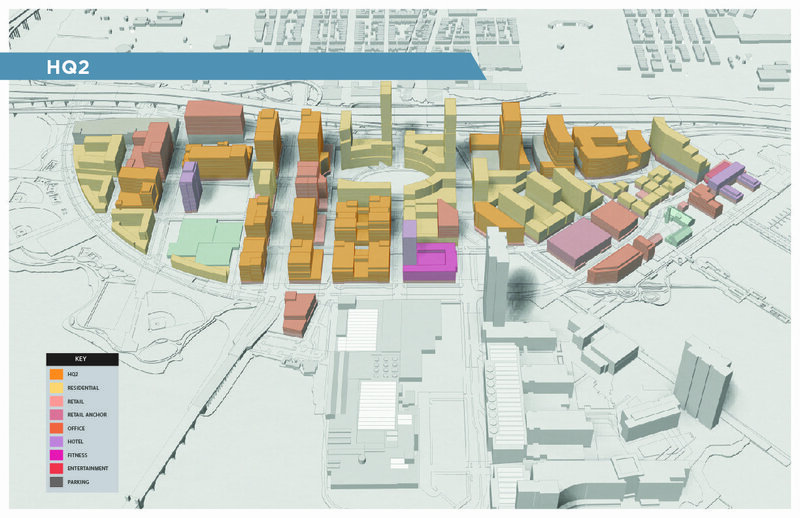 The Port Covington bid for Amazon did not propose buildings in the Rye Street Market section of the area, but in separate sections of the master plan. The $5.5-billion Port Covington master plan includes Under Armour’s 50-acre, 3.9 million sq. ft. global headquarters at the former Port Covington Shopping Center; 1,500,000 sq. ft. of destination, attraction, entertainment, and specialty retail; 500,000 sq. ft. of “maker” and industrial/light manufacturing space; 200-plus hotel rooms; 1,500,000 sq. 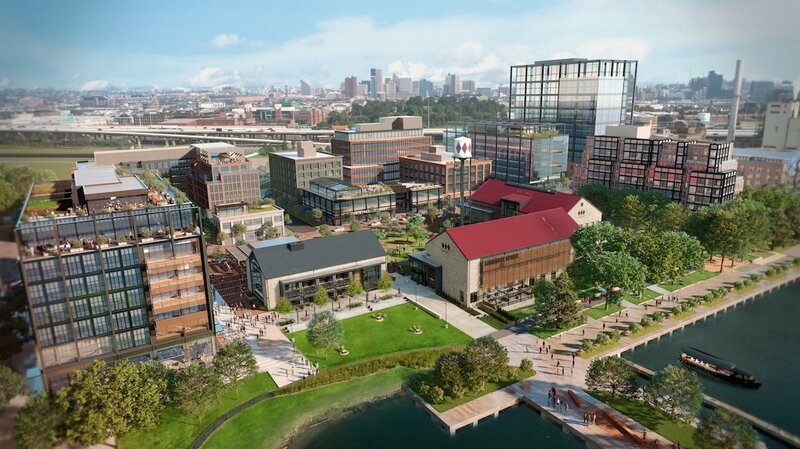 ft. of office space (in addition to the Under Armour Global Headquarters); and civic and cultural uses including 40-plus acres of public parks, a public waterfront, and other public facilities. It also includes more than 7,500 residential units, which could total up to 14,000 units comprised of rental and for-sale properties at various price-points, and potential sites for a post office, school, library, fire station, police paddock, and cultural center. The development includes 2.5 miles of waterfront along the Middle Branch. For transportation and infrastructure, The Port Covington Development Team is planning a light rail spur along McComas St. from Westport with three new stops; redevelopment of Hanover St., McComas St., and Cromwell St.; I-95 on-ramp and off-ramp modifications; bike share stations; three water taxi stops; and a site circulator that could be rail or bus. New on-street cycle lanes have already been installed in Port Covington. The Port Covington Development Team is also planning a walking/cycling bridge from the 1900 block of Light St. that would go over the CSX train track and under the I-95 bridges and land near Sun Park. It is also rebuilding the Spring Garden Bridge for pedestrians to connect Westport to Port Covington. Already completed at Port Covington in Phase 1A is City Garage, which redeveloped an existing building in 2015 into a 133,000 sq. ft. office building that is “a hub for manufacturing, innovation and entrepreneurship;” Building 37, which converted the former Sam’s Club into a 170,000 sq. ft. Under Armour office building and amenity space; 240 W. Dickman St., which underwent some renovations and is now the home to workforce development non-profits; and the four-building Sagamore Spirit whiskey distillery which includes Rye Street Tavern, and renovations the Baltimore Yacht Basin marina and Nick’s Fish House. The Port Covington Development Team has also made public space improvements which include landscaped medians, taking over maintenance of West Covington Park where it added outdoor bar South Point, a new mural, and adding new off-street and on-street bike and pedestrian paths.